I just loved this. So easy to learn just by relaxing and listening. I just listened through Bluetooth in my car on my very long trips to work and back. Just press play and off you go. Can't believe how quickly I learnt so much! I was first a bit put off by the instructor's slow voice, but realized after listening to other audiobooks that this method is fantastic! in two days I learned so much, without any effort at all. I am currently listening to 'in flight french', which is absolutely no comparison with the michel thomas method. The only problem with this book is that two novice french students are used; not an issue on its own but the female student in this book comes across as very dumb... she mispronounces things, and makes mistakes too often. I wondered whether this was part of the plan; learn from her mistakes. However, i wish they would have used slightly more advanced students instead of total beginners. The book is overall fantastic though, and any novice to French will find it useful. I studied french in high school and didn't remember a thing, but it's coming back to me now thanks to this book. I just wish it were longer! C'est très facile! It was very easy to follow along and learn. Builds very well and then all the sudden I'm speaking French! rated with 2 stars because the female student in this audio is a strong issue of distraction borderline giving the experience a negative atmospher. Just to be aware of it. Do you learn from this audio as easily as Michel Thomas states you can (yes)... yes you do learn. Listen to his suggestions/guidelines on how to use this audio without the drilling, or trying to think too hard. 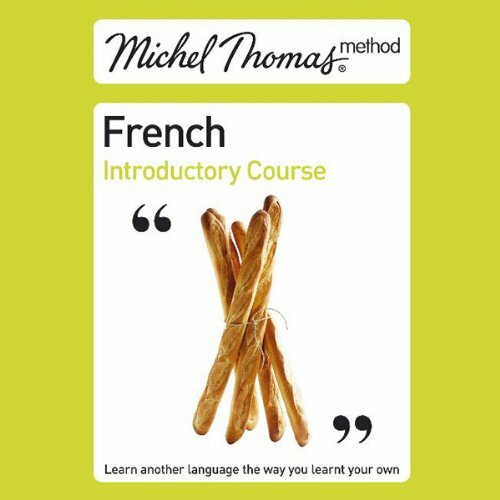 The introductory course is a good review of some basic French phrases. While this will expose the listener to the Michel Thomas meth, his normal courses are much. better where they start small with a basic phrase and quickly build on it in a way that brings familiarity. I love this style of learning language - it teaches *functionality* so you feel like you might actually survive holidays in France! The word association was very helpful to breakdown sentences. There was a sense of accomplishment by stringing all the new words together. Good intro course. I bought this audio book on a whim as I have wanted to learn French for a while - even though I dropped it a 'O'-level in 1976. I had always found French lessons hard work - this book opened my eyes to how simple it can be: 60% of the English vocabulary is broadly the same as French - how cool is that? One immediately has a significant French vocabulary. Very clear method and I find myself enjoying it - and I can speak half reasonable conversational French within a couple of days. My wife struggled and struggled with various French courses, both at adult classes and also with several video and/or audiobook sets. Nothing worked for her until I bought her the Michel Thomas course. His approach is quite different from other courses and enabled her, for the first time, not only to communicate with others in French but to enjoy the learning process. I'd recommend it to anyone who has tried other courses only to give up. WHEN WILL THE REST BE AVAILABLE!? I loved this. So much that I can't wait for the next instalment. But it is not on audible yet and I can't find the download anywhere else but iTunes (where it is very expensive). Please please please make the rest available audible! Stuggled with French as school. Aquired this for my kids, but am really enjoying it myself and making progress like I wouldn't prevoiusly have perceived as possible. In 20 minutes it has changed my daughter's attitude to French. After doing the course for 20 minutes she was all smiles and announced she finally 'understood' how she learnt. Things she could work out she did well at, Maths Science even English. She finally now 'understood' French, she has got it. It is quite remarkable the small sentences she is now putting together with ease. This introduction to the french language hooked me immediately. Mr Thomas reveals straight away that you can speak many French words just by putting on a Monty Python french accent as over half of the modern English language came with William from Normandy back in 1066. Your teacher makes it easy to formulate complex-sounding sentences and you are filled with self-satisfaction as you recite them back to yourself after he has taught the other two students or, even better, beat the students by working it out and saying it first. Speaking of the students: If you have never spoken a word of French in your life then were almost certainly be able to keep up with the recording even though, as promised in the first 2 minutes, there is no beep sound to tell you to stop and recite the preceding phrase. If, like me however, you still remember some of the French you were taught at school and you are giving the recording your full attention then you may become frustrated when waiting for the students to get it right after coming to the correct answer yourself ten minutes ago. Then again, this does provide you with an opportunity to feel very superior to those poor, dumbfounded students, which is, for me at least, a source of great enjoyment. Dawdling students aside then, this is a great way to start or get back into learning French and I would reccomend it thoroughly to anyone thinking about doing just that. Download it onto your iPod, get your boots on and go for a walk. Then wonder why everyone keeps giving you quizzical looks as you stroll around talking to yourself with that outrageous accent. A must for all language learners. Exceeded expectations I can't wait to listen to more. Lesson 3 downloaded already. Bring it on. Very very good book. I bought this for myself and my wife and we have been impressed how well and easily it is teaching us French. a language we love but which we have previously struggled to grasp and retain. Michel Thomas's method is revolutionary and inspiring - and he even tells you not to write anything down or learn anything by rote! We have already started working through his 7 lesson programme (also available on Audible). Loved the way this felt so easy and practical, learning relevant language to what I would need when going to France and helping me organise basic sentence structures for myself. Highly recommend for any beginner or a refresher!